Twenty Vikings (including Kim and Joan from Ginninderra and John and Paul from Molonglo Water Dragons) headed to SOPAC to take on swimmers from 42 other clubs at the 2017 NSW State LC Championships. With equal numbers of men and women we were able to field 17 relay teams; amazingly with three teams in the 280+ age group. Caz spent a lot of time deliberating over possible team combinations to get the best across the age groups. Our two Women’s Medley teams won gold while several other teams finished in an incredibly close second place in their events. 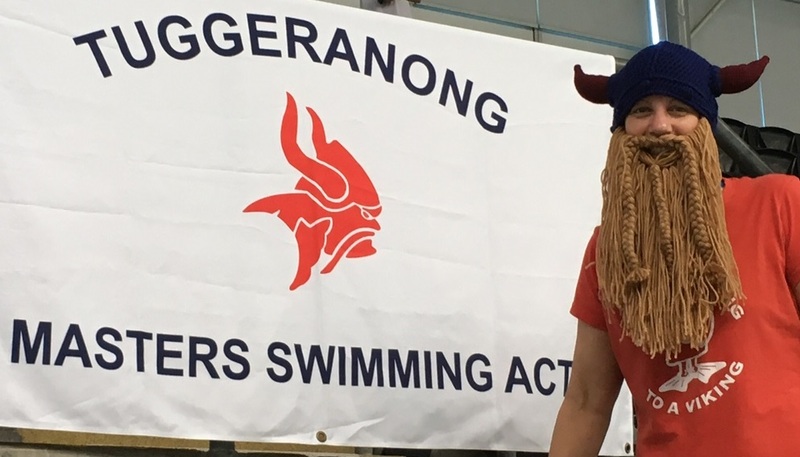 Tuggeranong finished in third place from the 43 competing clubs on total points but also scored the highest on average points per swimmer of 24 clubs with 4 or more swimmers competing. We also won the Biddy Hall Memorial trophy for the highest average score per swimmer of the clubs with 10 or more swimmers. Go you Vikings! Four swimmers won medals in each of their five individual events: Pam, Katrina, Cecelia and Gary and there were lots of fantastic individual swims, lots of PBs, some great relay swims and lots of team esprit! Some last minute instructions regarding legal turns when swimming the individual medley earned Richard a gold medal rather than a nasty DQ after his name. Katrina learned about filming upside down on her iPad. Ann showed off her new Viking “helmet”. At dinner on the Friday evening in Blacktown, Cecelia won some Easter eggs in the raffle! During the lunch breaks on both days various awards for 2016 were distributed. Anne Smyth was awarded the Ian Davis award: the NSW board selects the winner of this award – someone under the age of 60 years who has contributed to their club and the branch. Congratulations Anne! Some very bright orange embroidered towels were given to the swimmers who accrued the most BPS points in each age group across NSW Masters Swimming. Our youngsters, Jenna and Kade, were both named age group champions for 2016. 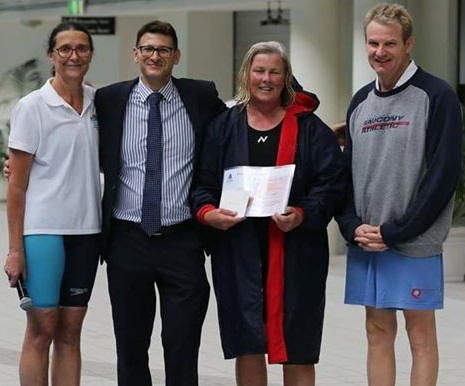 Nic Grinter, who has been training with us since taking up employment in the ACT, also won his age group and was also awarded for reaching his three million metres. There were also a number of certificates for National and Branch records presented.